Hello! I´m an ESL teacher in Belarus. I´m glad to be a part of this fantastic community of teachers! 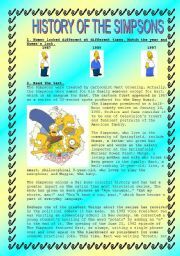 How did the Simpsons start? Find it out when reading this text, doing 4 exercises (matching, comprehension questions, true or false, fill in the gaps). 3 pages, with the key, editable. Enjoy! 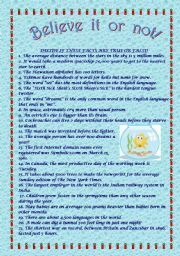 An amazing collection of unbelievable facts presented in the true or false exercise, 2 PAGES, with ANSWERS. Read, speak and enjoy! Can Weather Influence Our Behaviour? Amazing reading about weather and our mood, with 3 tasks, a brainteaser and answers on 3 PAGES! Generates great discussion with students! 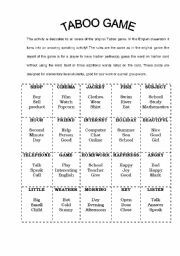 This is a simple activity based on the original Taboo game, where you have to define the key word without using a number of "taboo words". My elementary-level students loved it! What do gestures around the world mean? This is an activity to enrich your students in a cultural way and to have a great discussion afterwards. 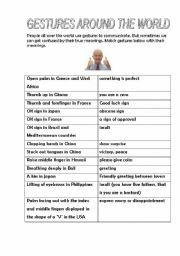 A text about the meaning of colours according to Feng Shui with 4 TASKS, including a very good exercise on WORDBUILDING, plus the KEY. All in all 3 PAGES. The right reading for curious students! You will find 4 types of exercises on all tenses, active and passive voice: 1 - multiple choice, 2 - fill in the gaps, 3 - correct the mistakes, 4 - complete the text. All in all there are 4 pages with answers. Quite challenging, but a very good drill. British food. Ways of Cooking. Learn more about food in Britain. 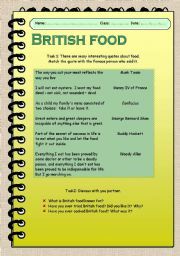 Start with a matching exercise on quotations, then learn vocabulary connected with ways of cooking and different ingredients, and finally learn how to cook according to genuine British recipes! 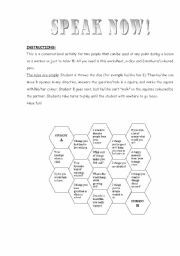 This is a conversational activity for two people that can be used at any point during a lesson as a warmer, energizer or just to relax :-)!